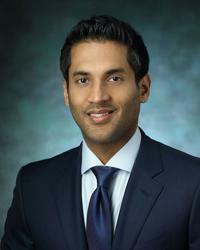 Gajan Sivananthan, MD, is an interventional radiologist affiliated with MedStar Washington Hospital Center. He takes special interest in minimally invasive treatment for men’s health conditions (benign prostatic hyperplasia and varicoceles), vascular disease (deep venous thrombosis, pelvic congestion syndrome, varicosities, and vascular malformations), and oncology (liver cancer, renal cell cancer, lung cancer, and benign and malignant vertebral compression fractures). As an interventional radiologist, Dr. Sivananthan performs endovascular procedures that use catheters inserted through arteries or veins. He also performs percutaneous procedures, where needles are inserted into diseased parts of the body using CT, MRI, ultrasound, and X-ray guidance to treat tumors while minimizing damage to normal adjacent tissue. He is dedicated to providing the most effective, safe, and least invasive procedure for each patient. Dr. Sivananthan performs unique procedures in the field of interventional radiology, including treatment of benign prostatic hyperplasia (BPH) using prostatic artery embolization. Prostatic artery embolization has had a profoundly positive impact on men who suffer from BPH while preserving erectile function. Alternatively, prostatic artery embolization can oftentimes be performed in men who are considered to have a high surgical risk for alternate procedures. Dr. Sivananthan received his medical degree from Robert Wood Johnson Medical School, where he stayed to complete a one-year internship in internal medicine. He then joined Tufts Medical Center to complete four years of residency training in radiology. Finally, he joined Mount Sinai Medical Center for a subspecialty fellowship in vascular and interventional radiology, where he stayed on as faculty, before joining Washington Hospital Center. Dr. Sivananthan is passionate about building the Interventional Radiology Department into a paramount center for the treatment of interventional oncology, benign prostatic hyperplasia, and vascular malformations at MedStar Washington Hospital Center. He actively participates in the advancement of the field of interventional radiology and has authored and co-authored a number of peer-reviewed publications and has presented nationally on numerous occasions. “I view my role as a partner with my patients to help them through their illness. My approach is to first listen to my patients so I can understand their goals of care, and then, together with the patient and their family (if involved), determine the best therapeutic options. I listen to my patients -- this is the first step in effectively communicating and establishing a therapeutic relationship. “I am always available to discuss complex cases with referring physicians and am dedicated to taking good care of their patients in a collaborative fashion."